He had some helpful suggestions. 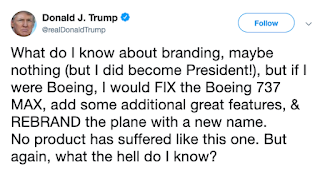 To Boeing's credit, it appears that the idea of fixing the design flaws in the affected models had already occurred to them. 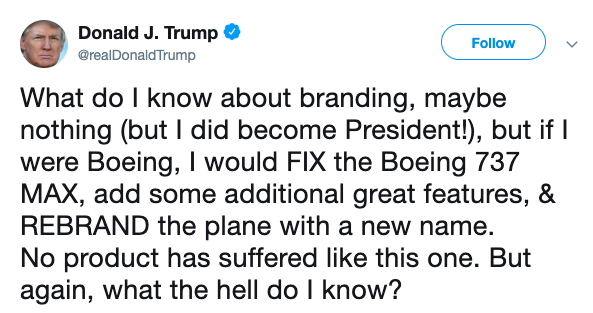 But Trump does have some airline industry experience: one of his many failed businesses was an airline that he "branded" with his own name. Later in the day, he jumped at the opportunity presented by the burning of Notre Dame cathedral to advise French firefighters that it was important to fight fires quickly. Trump's theory of firefighting does not extend to installing legally required sprinkler systems in his namesake apartment building in Manhattan. There are two possible explanations for Trump's sudden interest in other people's jobs. One is that with the release of a redacted version of the Mueller report expected this week, Trump has been going out of his way to preemptively distract media attention from it. For example, the New York Times reported today that, according to people close to him, Trump's recent suggestion that he could "punish" so-called sanctuary cities by busing asylum-seekers to them was just an attempt to change the discussion away from the Mueller report. Trolling Boeing and the city of Paris may be part of that same strategy. The other explanation is that Trump appears to genuinely believe that he is an expert with valuable advice to give on almost every subject, ranging from "the nuclear" to innovative cybersecurity practices to modern warfare. It's wrong to try to score political points off of other people's tragedies. Inability to understand that you are not an expert at everything is a symptom of serious mental health problems.